A new Lenovo Phone model, most likely to be the successor to the unannounced Lenovo K7 Note has just been spotted on GeekBench .Though the Lenovo K7 Note is yet to be made official , Lenovo has been teasing the K7 Note on its facebook page. While the previous K Note series member was available only in 3GB and 4GB versions , the upcoming Lenovo K8 Note will come with 4GB of RAM and run Android 7.1 Nougat out of the box . 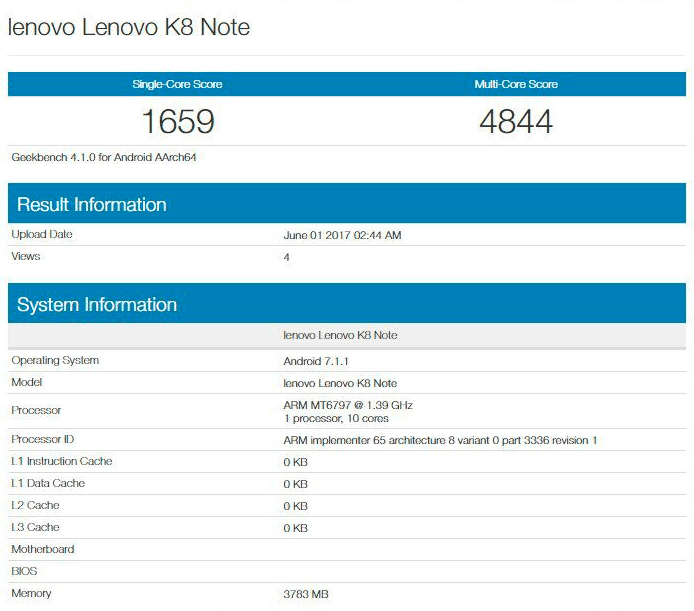 The device as listed on the Benchmark site shows no record of the onboard storage , but it did record that the Lenovo K8 Note is tipped to come with Deca-core Helio X20 chipset . Other details remain sketchy at the moment . Just about a year ago, Lenovo launched the affordable Lenovo K6 Note ,and it is only natural for the K7 Note to suceed it , but wether or not Lenovo would skip Lenovo K7 series for the K8 Note still remain in the dark .